One of the best days of NASCAR Champions Week comes when all of the Chase Cup Drivers take to the Strip for the lap around the Las Vegas Strip, well that happened today, but with one little glitch for their final burnout. As fans packed the Strip at the intersection of Harmon Ave, all of the cars sort of just drove right by and even Jimmie himself seemed a little caught off guard when he just pulled through the intersection. 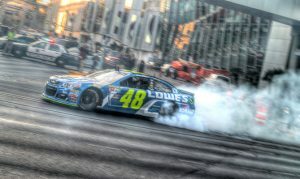 Well back up the cars and push for some, they did it again and finished out a great afternoon of events for fans alike. The most interesting part of the evening came at the After the Lap Celebration, where all of the drivers and fans get together for a little roasting of the sort. This one was all about Smoke, Tony Stewart and his departure from the sport. No doubt that bottle of Patron Tequila made it a little more interesting for fans, but like always the host for this one made it fun. Guy Fieri seems to do well with the off the cusp questions and added punch for the guys to go at each other. 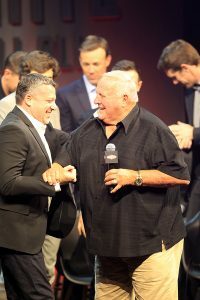 NASCAR Sprint Cup Driver Tony Stewart and Legendary Driver and Owner AJ Foyt meet on stage as Tony’s retirement surprise. The evening concluded with a huge celebration Victory Lane style for Stewart and a perfect way for this legend of racing to say goodbye to the sport. Stewart even had a special guest in A.J Foyt join him on stage as he claimed Foyt as one of the guys who motivated him in the sport to become legendary in both a good and bad way. Tomorrow evening the Champions Week wraps up with the annual Awards and Red Carpet Celebration from the Wynn Hotel and Casino.